We deliver all throughout Oahu – from the city to the beach! Above and Beyond Delivery brings our same beliefs and values to the islands. Jim Bowman, our president, always asks the question – Did we go above and beyond today? Not a day goes by without this question asked of everyone on the Above and Beyond Delivery team. On top of our excellent work ethic, we specialize in relationship-building and creating a loyal customer base. Quality service is often underemphasized in today’s society. We make it a point to provide the highest level of service possible to our customers. Each of our team members is educated and trained to work diligently to achieve those results each and every day. 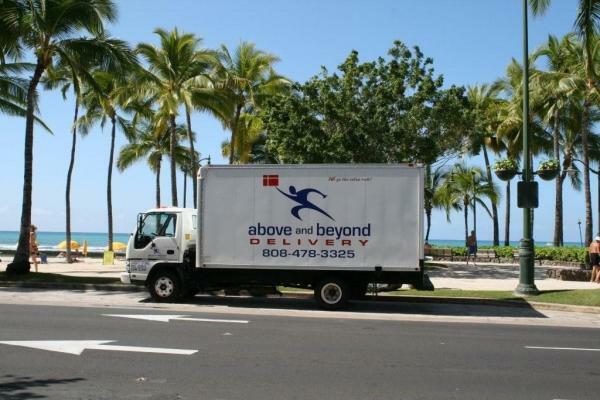 Above and Beyond Delivery Hawaii has been in business since 2006 and continues to grow. We deliver to all the Hawaiian islands – with our main office located in Honolulu. Our couriers follow the same philosophies as the couriers on the mainland; we exceed expectations with our high quality delivery service and efficiency. Our drivers are 100% Above and Beyond Delivery employees. We do not employ contract drivers and as a result, our drivers treat every job with the highest priority. You can rely on Above and Beyond Delivery for all your same day scheduled and routed freight and delivery needs in Hawaii. If you have questions about our Hawaiian services or would like to request a quote, contact Guy Logan, Operations Manager. Or you may complete the Request for Quote Form below. Provide as much detail as possible so we can understand your needs.